Camp Catatonia: Where does this picture come from? 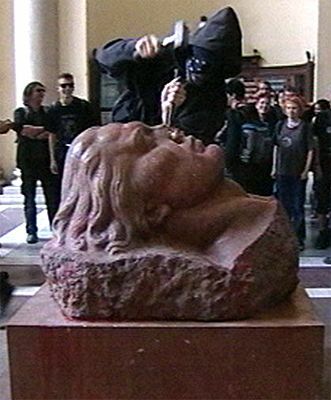 A dubious monument in the hall of Vienna’s main university was damaged today, by masked persons. The monument, called “Siegfried’s head” (“Siegfriedskopf”), had been installed by German nationalist students in 1923, in order to commemmorate war veterans from World War I. After much debate, the university decided in 1990 to have it removed, because a historians’ commission had determined that it also symbolized the antisemitic and anti-Austrian goals of the students congregations who had put it there. In 2002, it is still there. So actually these people were hammering a nose off a non-existent monument. Allegedly this morning. A cameraman of the Austrian Broadcasting corporation just happens to be there and takes pictures. Am I supposed to believe this? What do we really see on this picture? And where does it come from? Update: a friend just told me that ORF local TV showed the entire scene of the masked ones hammering away. I haven’t seen it, but still I consider it really odd that a TV team would just hang out in the main old university building when suddenly some masked person approaches the statue and pulls out a hammer. There is something. There may be something normal. There may be something fishy. There may be something network-style. Hammering a nose off a statue? The man read too much "Asterix and Cleopatra"! ah, the annual asterix-enactment! now I get it! Anyway, it gives a new meaning to the term "picking your nose". But seriously: Wasn't it a custom in the Ancient World to deface your enemy's statues? Politics doesn't seem to have come far since then. Not just in the ancient world, http://.../>of course. I personally would have preferred it if they had beheaded the statue. I would also have admired it, as this darn thing is pretty heavy! Defacing a monument that doesn't really exist anymore... That's neo-symbolical politics, isn't it? Like haunting a spectre.